If you are what you eat, we are currently part margarita (although I think we’re permanently part Margarita 🙂 ), part zucchini, part peach, and part ice cream sandwich. We’ve been making ice cream sandwiches as a fun way to cool down at the end of the 100+ degree days. The possibilities for homemade ice cream sandwiches are nearly endless: any ice cream, sandwiched between any two cookies. It can be as quick and easy as you need, or as fussy as you want. For the last batch that I made, we chose fussy over quick. Festive over classic. 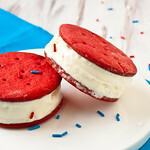 I converted a standard chocolate ice cream sandwich cookie recipe into a red velvet cookie. A soft, very red cookie with barely a hint of cocoa. Very pretty. 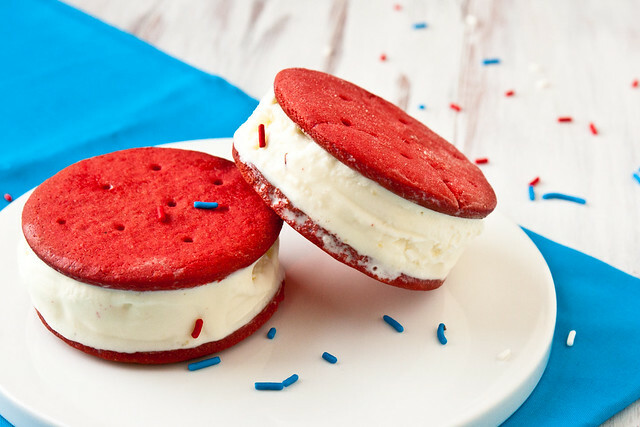 And since red velvet is often paired with cream cheese, we filled the sandwiches with a tangy frozen yogurt. You can cut any shape you like with that drawer full of cookie cutters or simply opt for the classic rectangle cookie. Either way, it will be a little messy. And a lot of fun. A festive twist on the classic ice cream sandwich. Whisk together dry ingredients in a bowl and set aside. Cream butter and sugar together until light and fluffy, 3-4 minutes. Add vanilla and egg, mixing until combined. Add red food coloring to the bowl and then slowly add the dry ingredients to the mixer and mix on low. Turn the dough out onto plastic wrap, press into a disk, wrap well, and refrigerate for 30 minutes. Roll dough out to 1/8-inch thick on a well floured surface. Cut 12 4-inch circles out of the dough and transfer to 2 parchment-lined baking sheets. Re-roll any dough scraps to cut more cookies. Poke holes in the cookies with a fork and refrigerate for 30 minutes. Bake cookies for 7-8 minutes for soft cookies, 8-10 for crunchier cookies (the crunchier cookies hold up better to all the handling/smooshing/filling). Let cool before sandwiching cookies with ~1/2 cup softened ice cream. Place into the freezer for at least 15 minutes to refreeze the ice cream. You are a *genius*- I am all over this one. This looks soooo good. And just in time for the 4th of July! YUM!! Aweosme idea! I love how perfect your cookies look! Awesomeness! you are just so fabulous. some of the best desserts in life are messy. Case in point. I am currently part coconut lime sugar cookie. And my thighs are super unhappy about it. One day I’ll be part salad. One day. I made ice cream sandwiches out of coconut macaroons and they’re sort of “rustic” but yours are gorgeous!!! I want one right now! So yummy! These look amazing. Love the perfect red color! Yum! Forget the Skinny Cow, I’m having these for dessert next week! shaunda, these are so clever and gorgeous! Love this! I really like red velvet anything. Just made these and they are delicious. Mine didn’t come out bright red though. More of a brownish red. Did I add too much cocoa or not enough red gel. I did go by measurements in recipe. Thanks for your help-and the recipe.